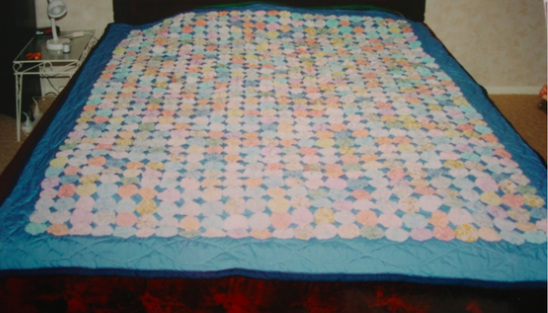 The one and only EVER yo-yo quilt made by me. Unbelievably my second ever project. You know those moments of insanity when something sounds like a great idea when it REALLY isn't? This quilt was one of those moments. We had a tiny church in Dunedin and one of our ladies was unwell. With the handful that remained I suggested we each make a few yo-yos to create a quilt for her. Enthusiastically these women agreed. I cut out a huge stack of circles from whatever was available and distributed them. They each promptly completed about eight circles each then abandoned ship. Seriously? The top was 25 x 32. It required 800 of these ignoble things. They had made less than two rows. It was up to me to make 23 more. AGHHH. So for a long time yo-yo making was what I ate, breathed and slept. Of course you don't just pick up a stack of these little monsters and call it a quilt. After creating the hundreds needed, they then had to be sewn together. Then put on a backing. In my ignorance I bought to cheap poly sheet and hand stitched a tie through each circle. What WAS I thinking? After this, my will was crushed and I used the sewing machine to make a wavy line around the edges. The back was a mess of multicoloured ties and sewn wrinkles. It would be a while before I thought about quilts again.